For a number of years the location of the former King’s Head pub, known to have existed from licensing records, was lost to us. All that changed with an intriguing discovery during demolition work next door. The King’s Head, incidentally, is not to be confused with the nearby King’s Arms & Castle on the opposite side of the road. According to Rob Steward in The Inns and Roads of Kenilworth (Odiborne Press, 2000) the King’s Head was known from an advertisement of sale in 1778 to have been “adjoining the Turnpike Road” (i.e. Warwick Road) and to have been “a substantial building of recent erection with sashed front, with six rooms on a floor, also four arched cellars. Adjoining Daniel Day’s large wheelwright’s shop and yard”. But precisely which building this referred to was not known. 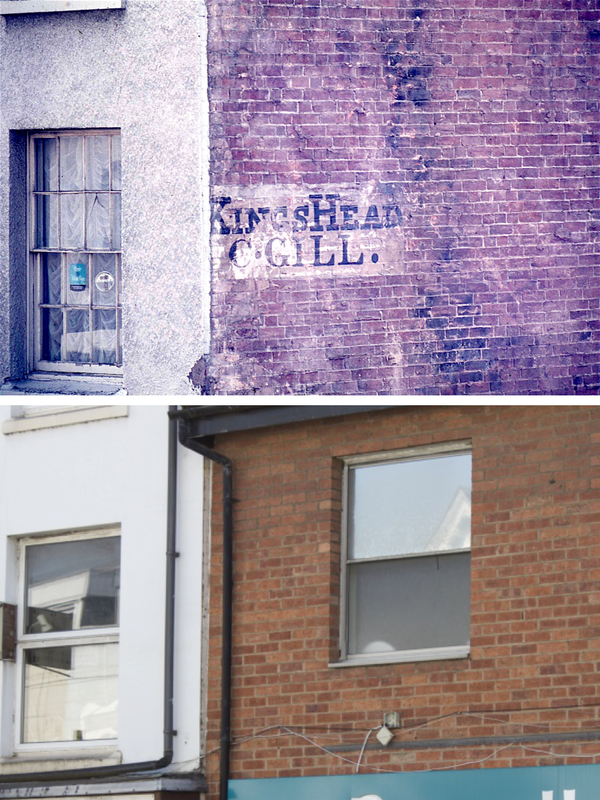 However, in 1974 demolition work on the site now occupied by Poundland revealed a painted sign reading “King’s Head – C. Gill” on the wall of the building next door, now occupied by Nails 4U and The Barber Shop. An article in the Kenilworth Weekly News of May 3rd 1974 in the KHAS archives recounts how local historians of the day puzzled over what this meant. John Drew provided street directories showing that Charles Gill had been a painter, plumber and glazier in what is now Warwick Road and The Square. Evidently, Charles Gill then became proprietor of the King’s Head inn. The KWN article also mentions that there was a nearby pub called The Rose & Crown, on the site of what in 1974 was the London Cleaners laundry, now a mobility scooter shop. The entrance to the Rose & Crown’s yard was through the archway that still exists, facing the clock tower.